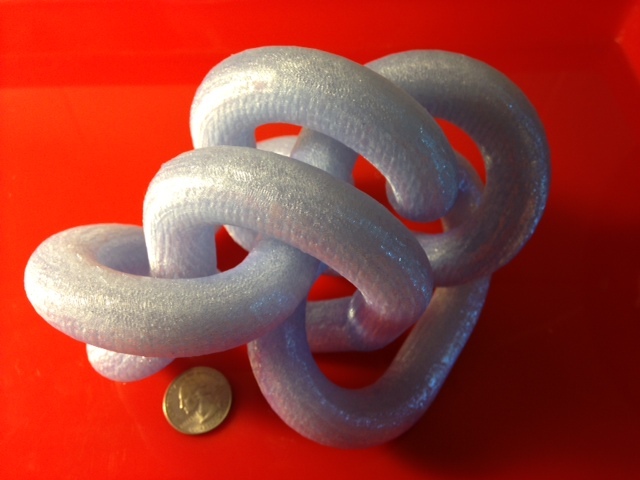 Two days ago we printed some mini knots; today we go to the opposite extreme and print a GIANT knot! It was really fun seeing the looks on people's faces when they saw this giant thing. It looks even better in person than it does in the picture. Settings: MakerWare custom knot-slicing profile as used in Day 9 of this blog. It took 10 hours and 2 minutes to print. Technical notes: This is close to the largest knot that I could have printed in the MakerBot. Mathematically this is the knot 10_125, in a minimal "Cantarella configuaration" as described in the Day 9 technical notes. Stuff you might want to change: The fill settings on the slicing profile were pretty dense, which was good for the transparent filament (large hexagon fill tends to show through oddly), but I think for an opaque filament I would use a much sparser fill; this should decrease the print time significantly.